Imported steel-cut oats are increasingly more readily available, but they are expensive and not always as fresh as they might be. I recommend buying steel-cut oats (as well as oats in other forms) from bulk bins — they are far more affordable that way and don’t involve shipping grain halfway around the world for your breakfast. Leftover oatmeal can be worked into pancakes, muffins, and bread. I love the texture and moistness precooked grains give to a dish. Some might call it mushier, but I see it as a nutty, nice variation. Bring the water or milk to a boil in a heavy saucepan. Add the salt and pour in the oats. Reduce the heat to a simmer, cover the pan, and cook, without stirring, until the oats have softened and plumped up, 20 to 25 minutes. Turn off the heat and let sit, covered, for another 10 minutes. If your cereal is too thick, you can always thin it with more water or milk. Traditionally, Scotch oats are served with cold milk. Garnish the finished cereal with chopped dried fruit and nuts. Sweeten to taste with honey, agave nectar, or brown sugar. 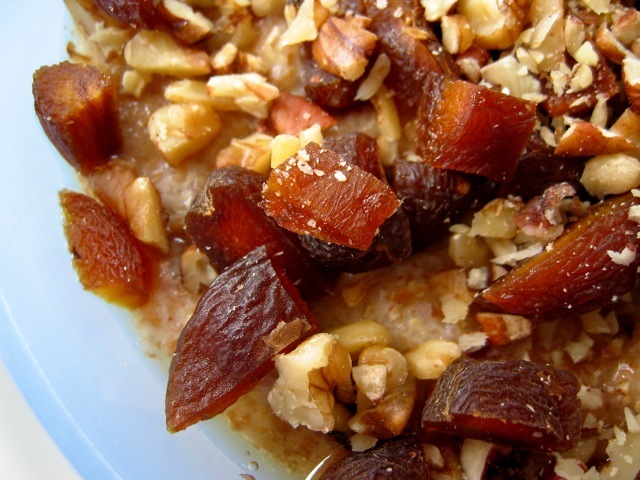 Read more in Deborah Madison's article about hot cereal breakfasts.